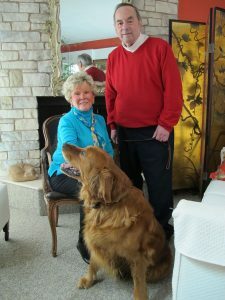 As a founder of Branford Compassion Club and Daniel P. Cosgrove Animal Shelter, Eunice Lasala has dedicated decades to the care and protection of animals. Now, her commitment has become the purpose of Branford Community Foundation’s (BCF) new Lasala Family Fund. A long-serving BCF board member and past president, Eunice has encouraged many to establish BCF legacy funds. Grants from funds helps sustain BCF’s mission to “…connect people who care with causes that matter, for the purpose of preserving and promoting the quality of life in the Branford Community, now and for years to come,” Eunice points out. “Anything people are interested in; whatever their passion is — they can go to Branford Community Foundation and a fund can be set up to their specific desires or needs,” Eunice notes. With her final BCF term arriving in 2018, Eunice and her husband, Tony, set their own philanthropic goal: creating a fund for the care and humane protection of Branford animals (domestic, feral or wild). The Lasalas elected to endow their fund through BCF’s “build-a-fund” option. The option allows donors five years to reach a $10,000 milestone, creating a perfect opportunity for family and friends to contribute as birthday, holiday or other special occasion gifts. In just a few months, contributions to the Lasala Family Fund have exceeded $14,375. BCF will start providing funding in 2019 as grant awards, according to BCF Executive Director Liza Petra.